The block diagram below lists many sources of carbon monoxide gas. It also shows many uses of carbon monoxide gas including Fischer-Tropsch reactions. COSTELLO provides design and technology for the purification of Carbon Monoxide gas with COPureSM . This technology provides a unique low cost solution to carbon monoxide recovery. 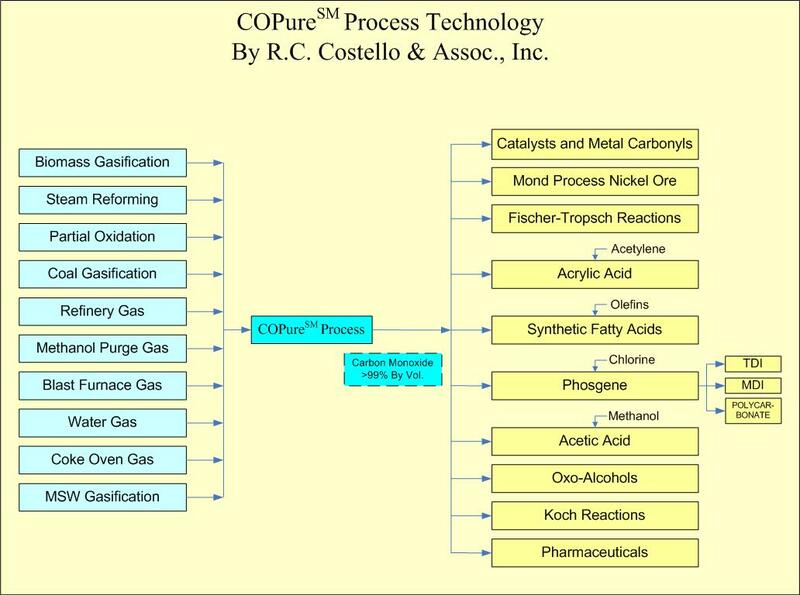 Process improvements have made COPureSM a highly reliable source of carbon monoxide for downstream manufacture of chemicals and pharmaceuticals. COPureSM can be considered whenever recovery of high purity carbon monoxide is required. This is especially the case when the feed gas contains significant quantities of nitrogen and/or carbon dioxide, which need not be removed. The COPureSM process selectively removes carbon monoxide by complexation/ decomplexation of carbon monoxide in a proprietary solvent containing cuprous aluminum chloride (CuAlCl4) dissolved in an organic liquid such as toluene. 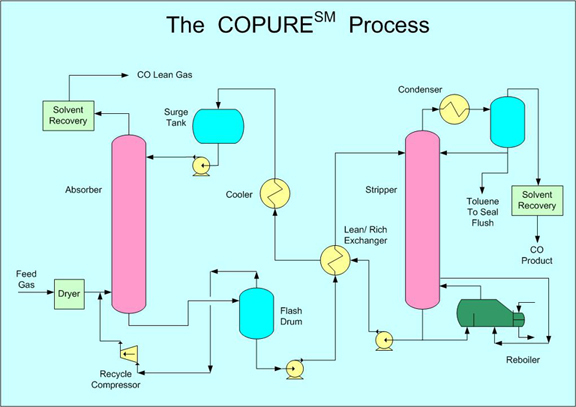 The COPureSM process may contain various post treatment or pretreatment steps that may include, compression, hydrogenation, dehydration, hydrogen sulfide removal, carbon dioxide removal etc. that are optimized for your process and plant configuration. For example if you were going to perform a Fischer-Tropsch reaction then purification of hydrogen and recombining it with the purified carbon monoxide would be included in the process. The basic COPureSM process is shown below. 1. COPureSM can handle, without pretreatment, feeds containing synthesis gas components such as hydrogen, carbon dioxide, methane and nitrogen. Cryogenic systems need to completely remove the carbon dioxide prior to carbon monoxide separation to prevent solid freeze up in the extremely cold environment. 2. Cryogenic processing has great difficulty in recovering pure carbon monoxide when relatively large volumes of nitrogen are present due to carbon monoxide and nitrogen having very similar boiling points which are -191.5 °C and -195.79 °C respectively. 4. The COPureSM solvent has a high absorption capacity. 6. Most equipment can be fabricated locally, saving on foreign currency requirements, import duty and shipping costs. 2. Indirect cooling and heating. 6. Blending of the CO with the original hydrogen gas to the specified H2 : CO Ratio.